In September 1959, the Dean and Canons were contacted by Miss St Leger Forrest, who believed that her great great grandfather had painted certain windows in St George’s Chapel (SGC CL 17/3 (26)). She described him as an artist in the time of George III, who took over the work at Windsor from an artist who died. In her possession were two drawings that had been in the family since that time. The drawings show the Virgin and Child, with Joseph holding a lantern, and an angel surrounded by attendants and doves. They represent two halves of one window design, and in the bottom half of one is the signature of the artist, Charles Forrest [SGC P.347]. Very little is known about Charles Forrest, except that he was a pupil of Thomas Jervais, a Dublin-born glass painter who is best known for the west window of the antechapel in New College, Oxford. According to the published journals of Mrs Papendiek, a member of the court circle, Charles Forrest was also an accomplished musician who sometimes performed on the flute before the king. Together, Forrest and Jervais worked on the new east window of St George’s Chapel before their working relationship broke down and Forrest alone was given further royal commissions for subsequent windows. These windows represented the story of Christ’s birth, and were produced to designs by Benjamin West. The first window painted by Forrest was installed in the east window of the south aisle. This window depicted the Angel appearing to the Shepherdsand was unveiled to mixed reviews. It was replaced by Christ carrying the cross by Thomas Willement in 1847. 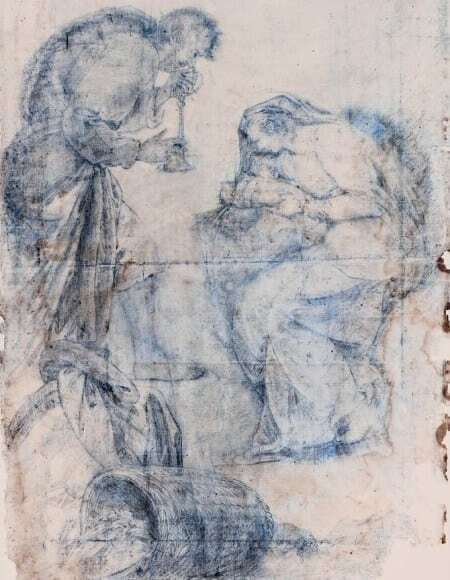 Although hurried and somewhat crudely sketched, in this image, which has been digitally enhanced, the figures of the Holy Family can be clearly seen. The third of Forrest’s windows was installed in the west window of the north aisle, and was a representation of the Adoration of the Magi. This, along with The Nativity, was removed in 1869 to make way for two windows by Clayton and Bell. Two squared and numbered plans were drawn up of the windows to help with their removal [SGC P.110/52], and their history remains a mystery. Charles Forrest then began work on the ill-fated Crucifixion for the west window. He died around 1807 with the work still incomplete, and although his wife attempted to finish it, the work was so painstaking that eventually she was forced to ask for assistance. With George III suffering from declining physical and mental health, and the fashion for painted glass dying out, no help was forthcoming. The last pieces of the work undertaken by Charles Forrest were packed up and put into store. It is not known why a relative unknown should have been selected to work on windows for such an eminent location, but two fragments which survive in the Archives show the attention to detail and level of care taken by Charles Forrest in his work for St George’s Chapel. Along with these drawings, they provide a valuable record of this part of the new decorative scheme introduced during the reign of the architect king, which saw the replacement of the organ, the addition of the Coade stone organ screen, the remodelling of the woodwork and reredos in the Quire along with the new windows.